Introduction: No currency has ever been used in the human history which did not have the stamp of an authority. Bitcoin is a medium of payment but it is not money for the same reason. Nonetheless, the technology underlying Bitcoin is a significant one with great potential. A central bank, issuer of paper currency, can use some selected components of Bitcoin technology to replace paper currency with virtual currency, retaining all the important features of paper currency. The most important of them is that a central bank note is a freely negotiable bearer bond and a legal tender in the hand of its holder. It does not require any third party verification. Counterfeiting a central bank note is not impossible but difficult and costly. The central bank neither authenticates any transaction made with that particular note nor does it keep any record of that transaction. The note remains as a liability on the book of the central bank till it comes back to it, either for reissue or its destruction. The physical nature of the note ensures that no double spending is possible with the same note by its current holder. In case of digital cash, the main issue that a central bank has to resolve is the issue of double spending without depending on third party verification of the same. What follows hereunder is an outline of a system that any central bank can implement to issue its own currency retaining most, if not all, of the desired properties of a paper currency. I am presenting below a system based on digital currency on a mobile phone. There is no compelling reason to believe that the same system cannot be implemented on a specially designed smart card with embedded chip. 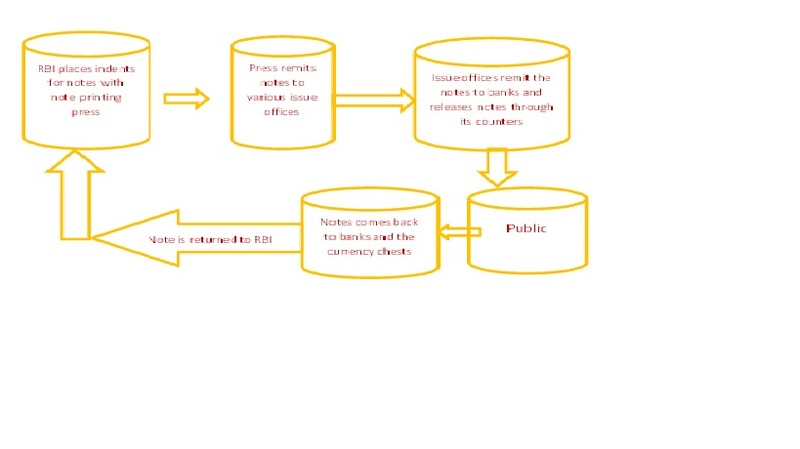 The system outlined below is described within the currency management framework of the Reserve bank of India (RBI). With little tweaking the same can be customized by any central bank. RBI carries out its currency management function through its 19 Issue Offices located across the country. There is a network of 4281 currency chests and 4044 small coin depots in selected commercial bank branches. These chests store currency notes and rupee coins on behalf of RBI. The note distribution mechanism is summarized in the following diagram. For issuance of digital currency, each currency chest would function as a data center for hosting the ledger book of notes issued from it. Similarly each issue office of RBI would have a copy of the entire ledger book of notes. A folio would be opened in the note ledger book when the first time a specific note is issued. Each data center will have complete inventory of wallets issued by RBI. Every bank branch would have a digital cash dispenser. Any wallet holder would be able to replenish her wallet with digital currency by pairing it with the dispenser via Bluetooth or NFC communication channel. Similarly every ATM would have similar facility. At the time of cash dispensation from bank branch or ATM would require Aadhaar based biometric verification of wallet. For cash transfer between wallets of two individuals this verification is not a necessary requirement. RBI would maintain ledgers of each currency note in a distributed database. Currently RBI issues notes through its Issue offices. The distributed database will be created according to issue departments of RBI. Each Issue office of RBI will be able to issue new digital currency and destroy old digital currency. Destruction of old digital currency would help RBI to keep the number of entries in the ledger folio of a particular note within a limit. Every Issue offices would maintain record of all notes issued by it as well as copies of corresponding records of 3 neighboring Issue offices. Each currency chest will have a database of notes received by it from RBI’s Issue department. The system will issue new digital currency when an account holder wants to withdraw cash from its account with RBI. The account holder would specify how much of its cash withdrawal would be in digital form. This facility would be provided for an interim period when both forms of currency would be in circulation. To incentivize issue of digital cash, RBI may reward with a fixed amount that could be related to the cost of producing physical cash. RBI is banker to the Central and State Governments. It also functions as banker to the banks and thus enables settling of inter-bank obligations. These account holders of RBI would get digital cash in their Jumbo Wallet which would be a server in the account holder’s custody. It would be like a till holding cash. An authorized person can withdraw e-Rupiah from the till as and when required. The RBI’s Note ledger would comprise ledger folios of each currency notes issued. Each record in the Note ledger would comprise the following attributes: (1) a sequential no, (2) unique identity / sr no of a note, (3) hashed value of the note serial no, (4) identity of the issue department, (5) denomination, , (6) time stamp of transaction, (7) hashed value of identity of paying wallet (first time payer would be RBI), (8) hashed value of identity of receiver wallet, (9) active flag, (10) hashed value of first 9 attributes , (11) hash value of the first 9 attributes of earlier transaction record of the same note. The identity of a wallet is described below. RBI will also maintain database of each wallet downloaded from its website. The wallet database will have a header record with the following attributes (1) IMEI no of each phone, (2) Aadhaar No of the phone owner, (3) timestamp of successful downloading of the wallet, (4) the GPS location of the phone at the time of downloading of the wallet, (5) a unique private key generated for each wallet and (6) the corresponding unique public key generated for each wallet. This data would also be hashed and encrypted with RBI’s private key and will be part of the header record. RBI’s public key would also form a part of the header record. The private and public key of each wallet would be generated by RBI at the runtime. The hashed value of attributes 1 to 6 would be the identity of each wallet. Each wallet will have its own database of transactions. Each record in the transaction database will represent a note that has been loaded into the wallet. Each record will have the following attributes: (1) unique identity of the note, (2) note denomination, (3) digitally signed (with the private key of the paying wallet) hashed value of the concatenated string of serial no and denomination, (4) digitally signed ( with the private key of the paying wallet) hash value of concatenated string of attributes 1 and 2 of the header record with private key of payer wallet, (7) public key of the paying wallet, (8) timestamp of last transaction( i.e. timestamp of receipt of the note , (9) timestamp of the payment transaction, (10) payment status (paid or unpaid), (10) hashed value of the earlier transaction of the note(attributes 1,2,3,4,5). A transaction between two wallets would involve “note data” transfer from the paying wallet to receiving wallet. Every note that gets transferred from the payer’s wallet to the recipient’s wallet would essentially mean transfer of the entire record from the former to the latter. In the process of data transfer two insert / update activities take place in the receiver’s and payer’s wallet respectively. The receiver’s wallet inserts a new note record while the payer’s wallet updates the concerned note’s existing record. Once the receiving wallet gets a new e_Rupiah note, it checks the authenticity of the note by calculating hash value of the concatenated string of attribute 1 and 2 of step at 13. In the payer’s wallet the status flag would get changed to “paid” while in the receiver’s wallet it would continue to have the status flag as “unpaid”. Any wallet would have a limit in terms of number of records / notes. When the database has reached its limit then the wallet would have to be uploaded to RBI and a new wallet has to be downloaded. At any point of time a single wallet would be subject to 2 limits- holding limit of no of transactional records and total value of a single transaction. For a high value transaction two factor authentications would be required. (say above one lac). Both paying wallet as well as receiving wallet has to simultaneously establish connection with RBI and get their credential verified. As and when no of records in a wallet’s transactional database reaches its limit, the database has to be downloaded in an ATM or at a bank branch. The wallet would be purged of the all transaction records with status as “paid”. The wallet holder then can download more E_Rupiah from an ATM or from a bank brunch. RBI will update its ledger book of individual notes thus uploaded from each wallet. Any fraudulent transactions identified in the process of uploading would get notified and thorough automated forensic audit perpetrator of fraud would get identified. Trading or Investing in Bitcoin is Injurious to your Financial Health. One of the fundamental lessons of all financial scams is that there always exists enough number of gullible people to be conned by merchants of dream. For example, the people of 17th century Amsterdam started believing that prices of a bunch of tulip bulbs could rise to a level higher than the value of a furnished luxury house. It also happened during the dotcom bubble of late 1990s. Presently such a bubble is unfolding before our own eyes and the sad part of it is that some financial sector regulators are actively encouraging formation of this bubble in the name of financial innovation. It would be apposite here to recall the scathing criticism that the Financial Crisis Inquiry Commission of US Congress made of the regulatory failure leading to the sub-prime financial crisis: We conclude widespread failures in financial regulation and supervision proved devastating to the stability of the nation’s financial markets. U.S. financial firms CME Group and CBOE are going to launch Bitcoin futures on December 18, followed by launch of binary options on Bitcoin by Cantor Fitzgerald. The US regulator for futures market, Commodity Futures Trading Commission (CFTC), has allowed introduction of these new products by these exchange platforms on the basis of self-certification submitted by them. The Commodity Exchange Act of USA allows such exchanges called Designated Contract Markets (DCM) to introduce new contracts by submitting a written self-certification to the CFTC that the contract complies with the Commodity Exchange Act (CEA) and CFTC regulations. It is the responsibility of DCMs to determine that the offering complies with the CEA and Commission regulations. (3) Exempt Commodity which means a commodity that is not an excluded commodity or an agricultural commodity. Prof. Shadab of New York Law School has argued in his written statement submitted to the CFTC that Bitcoin should be classified as “exempt commodities and not as excluded (currency) commodities “. Each Bitcoin future contract on CME would be composed of 5 Bitcoins. The tick size (the minimum fluctuation) has been fixed at $5 per bitcoin, amounting to $25 per contract. Per person open position limit has been set at 1000 contracts. The daily price fluctuation of a Bitcoin future is limited to a 20% band above or below the prior settlement price. The settlement price will be Bitcoin Reference Rate (BRR). BRR is calculated by UK based crypto currency trading platform -Crypto Facilities Ltd, in partnership with CME. BRR is calculated by taking traded price and volume data from a few selected exchanges involved in spot Bitcoin trading. Price and volume data are obtained for 12 periods of 5 minutes each in the last hour of trading. For each time interval, a volume weighted median price is calculated. The overall price is average of these 12 prices. So, purely from methodological perspective, construction of reference price cannot be faulted. Since BRR is based on observed prices of Bitcoins traded on mostly unregulated exchanges, these prices are always subject to manipulation. The extent of volatility that can happen on these exchanges can be understood from the movement of bitcoin price on December 7. On this day, the price of 1 Bitcoin fluctuated from a high of USD 19,000 to a low of USD 4,000. If the price volatility is considered in conjunction with volume volatility (see the graphs below), Bitcoin may turn out to be Twenty First century’s first virtual Tulip. Given this “insane volatility” ( as described by the chairman of BBCBS committee) of spot prices of a traded asset, the CFTC’s move in allowing derivative products on such an asset can be highly counterproductive. Apparently the CFTC believes that by bringing Bitcoin on a regulated platform it would be able to contain the speculative excess. The high margin requirement is expected to dissuade small investors to take positions in the Futures market, leaving the field open for play by institutional investors. More than 100 hedge funds have been created in the last one year to trade in digital currency only. It is reported that there is $10B of institutional money waiting on the sidelines to invest in digital currency today. To meet the requirements of these institutional investors, Coinbase, the US based Bitcoin exchange, has launched a new company to store securely their digital assets (see here). The company has claimed that it is already holding $9 billion of digital currency on behalf of its customers. It should be a matter of regulatory concern about the source of Bitcoin’s price volatility. Apart from alleged price manipulation the most plausible explanation would be the intrinsic unbridgeable gap between demand and supply of Bitcoin. New supply of Bitcoin is largely a result of mining activities and the maximum supply of Bitcoin is a known figure. Against the back drop of a largely inelastic supply curve, the demand curve is driven by enthusiasts of cryptocurrency- a fast growing tribe. The fundamental inelasticity of the supply curve is getting reflected in higher and higher cost of Bitcoin based transactions. The following two graphs show how running Bitcoin network becoming costlier and costlier. Given its inherent supply constraint, there is no possibility of Bitcoin becoming a global currency in its current form. Since Bitcoin is a highly sophisticated technological product, it attraction to young people is immense, like marijuana once was. But it should be the job of central banks to proclaim from the rooftop with as much force as it can command that: Trading and or Investing in Bitcoin is injurious to your financial health. “The history of all hitherto existing society is the history of class struggles” (Communist Manifesto). Communist parties everywhere consider this sentence written in 1848 by Marx and Engels as a well-established truth. However, it may also be considered as one of the greatest half-truths ever penned. This manifesto was the inspiration of those who created, in October 1917, the first state to actuate Marx’s vision of a classless society. After 100 years, to liken the idea of class struggle as the main driver of human history to a kind of religious baloney may sound blasphemous to many. However, a critical scrutiny of the Soviet Union’s history – from 1917 to its final denouement in 1991- with an open critical mind, would lead most to the same conclusion. History does not follow a linear path along one single dimension of human progress, be it moral, technological or material. The number of interpersonal or inter-group relationships that would be required to capture the dynamics of a given human society could be quite a many, even if we are able to abstract away many relationships that are inconsequential to the core elements of this dynamics. To expect that one single factor, the conflicting claim on the produce of economic activities, would be sufficient to capture such a complex dynamics for all societies that we know of is highly presumptuous. Without belittling Marx’s enormous contribution to our understanding of the complex relationship between organization of production and technology of production in a market driven economy, his linearized view of evolution of human society reminds us of the caricature of Maurier about the curate’s egg. But before we deliberate on the sweeping abstraction that Marx imposed on the past, we need to first deconstruct the concept of Class itself. Marx himself never defined this concept in any rigorous sense. The title of the last chapter of Capital volume 3 is “Classes”. This chapter was prepared and published by Engels in 1894 based on notes left by Marx. In this unfinished last chapter Marx raised the question of definition in the following way. The circularity of his effort to pin down his concept of class to a rigorous one is obvious. For Marx “landlords” is a class because the source of revenue for every member of this group is same. Does anyone who owns any quantity of land is a member of this class? What is the threshold? What are the other attributes that we need to make it a workable definition? To Marx’s credit, he was well aware of the inadequacy of this definition as in the next line itself he raises the immediate problem that this concept gives rise to. Unfortunately he did not finish this chapter to give his solution to this problem. Obviously this definition of class is not only inadequate but fraught with severe inconsistencies. This becomes apparent when we read Marx’s own analysis of the class contradictions afflicting the French society during the period of French coup of 1851 in which Louis-Napoléon Bonaparte assumed dictatorial powers. In fact, in his own words, the essay was written to “demonstrate how the class struggle in France created circumstances and relationships that made it possible for a grotesque mediocrity to play a hero’s part.” here He then goes on to identify the classes pitted against one single class – that is the proletariat. “The bourgeois republic triumphed. On its side stood the aristocracy of finance, the industrial bourgeoisie, the middle class, the petty bourgeois, the army, the lumpen proletariat organized as the Mobile Guard, the intellectual lights, the clergy, and the rural population. On the side of the Paris proletariat stood none but itself”. here (emphasis and underlining are ours). What is the definition of “middle class”? Are they different from “the petty bourgeois”? It is apparent that new entities which cannot fit into the abstract definition of class of the Communist Manifesto emerge spontaneously in analysis of actual social upheavals. Subsequently, all his disciples used the concept of class as a basic constituent part of any society in the same fashion a physicist describes the physical world in terms of atoms and molecules. This is axiomatic for a Marxist to consider class as real and observable entity. P. Thompson wrote the book “The Making of the English Working Class”. The title itself betrays the fragility of the concept of “class” as a primary driver of social dynamics. If a “class” is always in “making” then one’s class position cannot be unambiguous at any point of time. He considers “Class” as “an historical phenomenon” and not as “a “structure”, nor even as a “category”, but as something which in fact happens (and can be shown to have happened) in human relationships. This relationship takes shape only when “some men, as a result of common experiences (inherited or shared), feel and articulate the identity of their interests as between themselves, and as against other men whose interests are different from (and usually opposed to) theirs.” Presumably this identity crystallizes only when it is opposed to another group of men having a conflicting set of interests. History shows that there could be a myriad of conflicting interests that could bind people into opposing interest groups. More importantly, interests that separate a mass of people into two opposing groups needs not be economic nor needs to have a direct link with any production system. We know that people have fought bitterly and violently over ethnic, religious or even linguistic identity. Furthermore formation of opposing groups with conflicting interests need not be static as the dominant interest change over time. Going back to Marx’s original view about “class struggles” as the principal driver of the history, it is quite clear that the concept lacks any operational content. This comes out clearly when Marx himself attempts to identify the major factors that precipitated major historical events. As regards operational contents of Marx’s concept of “class”, it would be apposite to examine the view of Lenin, the architect of the first attempt to consciously and explicitly apply Marx’s concept of “class”. Lenin’s definition of “class” is prima facie quite clear and without much of ambiguity that Marx’s definition entailed. Suppose we want to apply this definition to any group of people from a given society. We would like to locate the class position of any member of this group. What would be the attribute that would capture the fuzzy notion called “relation to means of production”. Is it the occupation of the person? At what level of granularity the occupational status of the person would be considered? Does a cardiac surgeon employed in a top notch metropolitan hospital share the same relation to the social production system with that of a doctor employed in a rural health center, earning a small fraction of the former? Would a major shareholder of a multinational corporation with 100 thousand employees stand in the same relation to the production system as a capitalist employing 1000 employees, operating only in a regional market of a country would do? Although a billionaire capitalist and a small factory owner are both earn profit and thereby stand in an exploitative relationship with their workers, can we consider them as member of a “capitalist class in making”? We also need to understand the existential dilemma that Lenin was confronted with when Bolsheviks seized power in Russia. The “working class” or proletariat did not form the majority of working and oppressed people of Russia of 1917. He had to justify the seizure of power in terms of “class” and “class struggles”. He thus wrote: “In order to achieve victory, in order to build and consolidate socialism, the proletariat must fulfill a two-fold or dual task: first, it must, by its supreme heroism in the revolutionary struggle against capital, win over the entire mass of the working and exploited people; it must win them over, organize them and lead them in the struggle to overthrow the bourgeoisie and utterly suppress its resistance, of whatever kind. Secondly, it must lead the whole mass of the working and exploited people, as well as all the petty-bourgeois strata, onto the road of new economic construction, onto the road to the creation of a new social bond, a new labour discipline, a new organization of labour, which will combine the last word in science and capitalist technology with the mass association of class-conscious workers creating large-scale socialist production.” These lines can be mouthed by any leader of any country- just replace “socialism” by “our great nation”, “proletariat” by our “ patriots”, “bourgeoisie” by “ domestic traitors” and “capital” by “our enemies”. The plot remains the same ; only the actors change. In fact, history of Bolshevik rule as it unfolded in the post 1917 period is a testimony to the operational emptiness of the concept of class. If anything, it proves that human history so far has been history of struggles between old oppressors and emerging new oppressors. The role that a group of economic agents bound by common interest would play in that struggle cannot be inferred from their class positions as defined by Marx or Lenin. Marxists like Eric Ohlin Wright has to, therefore, invent the contradictory class locations of economic agents to somehow accommodate this obvious contradiction that Marx’s concept of class leads to. The root of this fuzziness and complete lack of operational content in Marxian and other related concept of “class” lies in the fact that human nature is more tuned to the biological and thereby existential imperatives of the species than its economic imperatives. A worker in a factory – a card holding member of a communist party- may behave almost exactly in the same way in relation to his homemaker wife as a capitalist owner of the same factory would do. A taxi driver may charge 3 times of normal fare in a flooded city as a capitalist would do when there is scarcity of its products. Transition from one “class location” to another one happens in case of many individuals depending on the circumstances and the underlying instability of such positions is not so negligible as to be of no consequence in social strife and interpersonal conflicts. It is generally observed that poor participate most vociferously and violently in case of ethnic and tribal conflicts. In such cases, how does the “class location” per Lenin explain the behavior of the person? It is utopian to expect that once the workers of a factory become owner of the factory, they would all work together harmoniously and with the common interest in mind. If human nature largely depends on the class location then efficiency and productivity should increase significantly with change of ownership. Under “proletarian dictatorship” all workers would give their best and achieve the maximum productivity given the material condition of production. There is no sufficient historical evidence to support any such assertion. Based on the historical evidence of changes in political and social regimes since the time we have trustworthy data, it may be safely asserted that human nature has not changed much since the time of the Old Testament, Chaucer, Homer or Ramayana. If one categorizes the conflicts that informed all these classics and compares them with their modern counterparts, it can be seen that some basic themes have remained the same. That is why it is so easy to transport the themes of Sophocles, Euripides, Kalidasa and Sudraka to contemporary times. Despite its fuzzy definitional content, very well intentioned serious scholars always fall for the fatal attraction of the concept of “class”. Because of their empathy for fellow human beings, they cannot but highlight social and economic inequality, deprivation and injustice meted out to one or more groups which get formed in specific time and context. For want of any better term we may call it a “class” – not in Marxian sense. The root of this empathy lies in human nature. Instinct for survival is the genetic in nature. For a thinking species like homo sapiens, survival is hierarchical. It starts with self and progressively embraces family, clan, tribe and perhaps nation and race. That instinct creates the ground for group formation and ensuing conflict between groups. At the same time, altruism is also etched in the human being’s gene because that would ensure that humanity does not experience the fate of becoming extinct from the face of earth, like the fate that had befell many other species in the past. There lies the fatal attraction for the concept of class. Digital currency is currently in news. Russia and China is reported to be on the verge of issuing official cryptocurrency. CME, the world’s largest exchange, is planning to introduce future on Bitcoin by the end of this year.Here Here In my last post I have explained why Bitcoin can be considered at best a currency of a community- a virtual country, so to say- of Bitcoin users. So a future on a foreign exchange of an unknown country without any verifiable foreign trade activities is definitely problematic. Be that as it may; the possibility of introducing digital currency by central banks is now a hot topic. The head of the Secretariat of the Committee on Payments and Market Infrastructure of BIS along with a colleague has recently published a paper on the Central Bank Cryptocurrencies. In this paper the authors have identified four key properties of Money- issuer (central bank or other); form (electronic or physical); accessibility (universal or limited); and transfer mechanism (centralised or decentralised). It is interesting to see that the authors have failed to identify the most important property of money- unit of account. A medium of payment is not a currency unless it is also a unit of account. That is why a credit card, a bank debit card or a prepaid cash card is not money, despite each being a digital medium of payment. In fact, in terms of volumes as well values, the medium of payments even in a developing country like India is largely electronic. The following table shows that money in India exists mostly in the digital form, as most of the bank money is. Even after exclusion of time deposit from the ambit of payment system, the digital money ( bank money) dominates the physical money or cash. So issuance of central bank currency would only digitalize the cash component of money as other medium of payments are already in digital form. So CBCC should be considered only as a replacement of physical cash issued by a central bank. The champions of cryptocurrency, however, would like it to be the sole medium of payments, at least of the online variant. It is difficult to understand why anybody would like to replace a part of the system that is working fine with another only because of its compatibility with a particular ideology about issuance of money. In fact, instead of reducing the cost, a decentralized transfer mechanism like bitcoin would increase the social cost of running a payment system. Leaving aside these ideological issues about money for now, let us consider the possibilities of issuing cryptocurrency by a central bank. I intend to outline a protocol that can be adopted in the specific case of India. In this post I enumerate the essential features that a Central Bank Cryptocurrency Currency(CBCC) should possess with specific reference to India. The Reserve Bank of India (RBI) spent on average 35 billion of rupees in printing notes in last 3 years, ignoring the spike of 2016-17 due to demonetization. This amounts to more than 500 million dollars- not a small sum. The commercial banks also have to incur huge cost over and above the printing cost incurred by RBI to manage the last mile of the currency supply chain. If we can replace printing of notes by creating digital strings of binary numbers in computers, the total cost could be easily reduced significantly. It is not necessary to eliminate physical cash completely. Digital and physical cash could coexist for a long time to come. When every citizen is connected to the digital space we can think of complete elimination of physical form of cash. Let us first understand how the paper currency system works in India. Before that, we need to consider the enormity of logistics involved in cash management system in a country like India. As on end March 2016, 90 billion pieces of notes and 89 billion pieces of coins were in circulation in India. The number of currency chests and coin depot/sub-depot were 4211 and 4008 respectively at the end of 2012. There were around 222 thousand ATMs in India. The details of the currency supply chain is given below. Note printing presses print notes as per indents placed by Currency Management department of RBI.One characteristic of the paper note is worth noting here; every note has a distinct identity. RBI remits the currencies so received to various currency chests maintained at bank branches. The commercial banks run the currency chests as an agent of RBI, while the treasure in it is the property of RBI. Any withdrawal or deposit into the currency chest is recorded as debit or credit respectively in the bank’s account maintained with RBI. Transport of currencies from currency chests to other bank branches is the responsibility of banks. General public can obtain cash from banks either over the counter of bank branches or from ATMs. Government departments having accounts with RBI withdraw cash from RBI counters to meet their cash needs, and thereby inject cash into the economy. When general public or government departments deposit cash into their bank accounts, the banks or RBI examine the circulation worthiness of deposited notes. The soiled notes are then withdrawn from circulation and briquetted by RBI. We are interested in designing a supply chain that delivers digital currency to general public, maintaining the basic functionality and integrity of the existing supply chain. We need not differentiate between notes and coins in the digital environment. .
Each note would have specific denomination- large denomination of 5000 and 10000 can also be introduced. If Alice wants to pay 102 rupees to Bob and Alice has only one 100 rupees and one ten rupees in her wallet, the system would function exactly the way cash based transaction would function. Alice would pay one 100 and one ten rupees to bob. Bob would immediately pay back to eight rupees to Alice in denominations available to Bob. Like Bitcoin there would be wallets as app in mobile or users can use hardware based wallet also. There is no question of having any exchange as custodian of wallet in dematerialized form. A person without a bank account can download a wallet and can receive digital currency in this wallet. There would be no special KYC verification for downloading digital wallet apart from providing a unique identification number. In case of loss of a wallet, the process would be the same as it happens if one losses one’s physical wallet containing physical cash. A First Information Report (FIR) has to be registered with a police station and the system would ensure that missing digital notes are blocked to the extent the digital money in the lost wallet has not been spent till that time. After completion of investigation the cash can be restored to the original owner. The central bank may prescribe a limit to the value of digital currency a wallet can hold. For example, it may be stipulated that the wallet is designed to hold a maximum amount of 100 K rupees. A wallet holder would not be able to load cash to her wallet from a bank or from another payer more than amount. It may be possible to take insurance for loss of a wallet with a sum insured to the extent of a pre-determined fraction of the amount lost. The wallet holder has to pay the insurance premium. It would be issued by the central bank as it is done today. It would retain the anonymity of cash to a large extent- but theoretically for a given transaction payer and recipient’s identity can be found out. There would be almost instant authentication of any transaction without any third party verification. The central bank would take the responsibility of authentication without any manual intervention. The process would be almost instantaneous as it happened in the use of debit card today. It would be a legal tender with the rider that if the recipient of a transaction is not ready to accept digital currency, the payer has to pay the former with paper currency. All government agencies would have the infrastructure to receive digital currency. No government agency or a public utility would not be able to deny any digital currency transaction if the counterparty insists on that form of transaction. Thus a citizen would be able to buy a bus or metro ticket with digital currency. Taxes also can be paid by digital currency. A bank account holder can go to a bank branch or an ATM and would be able to load digital currency in her wallet as if physical cash is being dispensed as it happens today. With the consent of its employees, an employer can pay wages or salaries in the form of digital currencies. Government would prefer to give subsidies through digital currencies. Digital currencies would not work outside the jurisdiction of the issuing central bank. Thus it is a legal tender within the country of issuing central bank. A foreign citizen can exchange foreign currency with digital currency as long as he or she gets the wallet downloaded from the issuing central bank’s portal. The only restriction is that if the wallet is used for transaction outside the issuing central bank’s jurisdiction, it would not be authenticated. A money changer can exchange foreign currency (paper form) with domestic digital currency. The central bank would be free to issue digital currency of any amount as it happens today. Is it possible to have CBCC with all the above features? Surely it is possible using the same technology that Bitcoin uses, with some tweaking. In my next post I will outline a high level design of such a system. I am confident that it should be possible to develop such a system which would not allow double spending and provide a very high level of anonymity to transactors and their transactions. Prof Aswath Damodaran (AD, henceforth) is a well-known name in the field of corporate finance and valuation of financial products. It is unfortunate that despite his formidable reputation in valuation of financial products, his latest “Musing on market” is a complete let down (You can read complete post here). He starts the blog by classifying investment assets into four categories. These are: Cash generating assets, Commodity, Currency and Collectibles. The first three categories do not need any clarification. But what about Collectibles? Picasso’s paintings fall into this category because they do not generate cash and, therefore, cannot be valued but it has a price. So, according to AD, something may have price but no value. For him “value” is synonymous with discounted future cash flow that an asset generates. So if an asset does not generate future cash flow, then it has no computable “present value” or “value”. This definition of value is a highly myopic interpretation of notion of “value” that has been debated from the time of Adam smith to Gerard Debreu. This apparent distinction between price and value leads him to differentiate between trading and investing. The only difference between a trader and an investor is that they make different intertemporal choices. An investor in collectibles has a choice to sell it immediately or sometimes in future. It follows logically that he finds that it is worthwhile to wait to get a higher price in future. Or he may get more pleasure holding it for a long time to come. The DCF valuation that financial instruments are subjected to, can be looked upon an estimate of the future market price. That is why; there is a market of financial instruments. If DCF is a correct estimate of “value” of any financial instrument then there is no reason why every dealer of a treasury would not have the same opinion about the intrinsic value of that instrument. If every trader has the same opinion would the market exist? According to him, traders do not bother about value but they only concerned about price. This begs the question – how price is determined in financial market? Although we are really not concerned about the distinction between value and price, the issue becomes relevant in the context of Bitcoin- the subject matter of AD’s blog. Per force, AD has to categorize Bitcoin per his own classification scheme. Bitcoin does not generate cash; it is not a commodity too. So we are left with only two categories for Bitcoin to be slotted. AD now considers the definitional attributes of a currency. These are well accepted and standard- unit of account, medium of exchange and store of value. Surprisingly AD finds that Bitcoin satisfies all the criteria to be designated as currency. According to AD, anything which is fungible, divisible and countable can qualify to be a candidate “unit of account”. If this is true, then theoretically any currency in any jurisdiction can function as currency. In fact, in some African countries, many small shops quote their merchandise in USD terms. But their balance sheets have to be prepared in terms of domestic currencies as per the law of the country. The acid test of anything to qualify as currency is that whether one can pay tax with that thing or not. AD gives three reasons for Bitcoin’s failure to take off as the preferred currency for majority of people. These are: – inertia, price volatility and competing crypto currency. He fails to note the most important reason- no sovereign backing. We have heard of dollarization of many domestic currencies because of people’s lack of trust on the domestic sovereign’s ability to preserve the purchasing power of that currency. But we must note that in no case people of such country start using the neighboring country’s currency, which could be as inflation prone as the former. In other words, backing of a powerful and trustworthy sovereign engenders the trust that is required for something to function of currency. The properties “medium of exchange “and the “store of value” neither jointly nor severally can make anything – real or virtual- a unit of account. The problem with the ongoing effort to declare Bitcoin as currency is rooted in this historically untenable proposition that money originated from the act of barter. There is enough anthropological and numismatic evidence to the contrary. The renowned numismatist P. Grierson gave the simplest definition of money – ‘all money that is not coin or, like modern paper money, a derivative of coin’. Historically, coins were always associated with an issuing authority. Thus sovereign backing is a prerequisite for something to become money in a specific jurisdiction. So Bitcoin is not a currency or money proper. Of course, we can argue that the community of Bitcoin coin users can be considered as forming a “jurisdiction”. The “Bitcoin” is a currency of that virtual jurisdiction. But then Bitcoin can be considered as a currency of only that country. Then, the population size of that country would be smaller than Democratic Republic of São Tomé and Príncipe (200K) of West Africa. The currency of that country, Dobra, suffered so much depreciation that the government had to issue a new Dobra in exchange of 1000 earlier Dobra. No foreign exchange trader has ever considered Dobra as a tradeable instrument. Bitcoin is experiencing appreciation of similar magnitude and, therefore, people are considering it as a lucrative financial asset. But to consider Bitcoin as a tradeable instrument would be blasphemous in the rarefied group of forex traders. AD, of course, suggests exactly the same in regard to Bitcoin. It might be fashionable to hold an extreme libertarian view in the current dispensation of USA. In that environment, as the then Citigroup Chief Chuck Prince told in an interview, just when sub-prime crisis was knocking at the door of wall Street – “when the music stops, in terms of liquidity, things will be complicated. But as long as the music is playing, you’ve got to get up and dance. We’re still dancing”. This was on July 10, 2007. On October 5, Merrill Lynch announced a US$5.5 billion loss, revised it to $8.4 billion on October 24. We hope that gullible investors awash with liquidity do understand that music is bound to stop sometime and who knows who would be standing without a chair then. Does Political Business Cycle exist in India? There exists a vast literature inquiring and modelling the nexus between politics and macroeconomic policy making. Mostly the western democracies have been the focus of empirical investigations on this subject, stirred by publication of the paper (Nordhaus1975) by William Nordhaus. This is not surprising as these countries have long history of regular elections based on two party system. Democracies in most of the developing counties are of post second wold war vintage and nominal in nature. In many such countries elections only provide a façade for perpetuating one party rule. India provides a unique case of a large democracy with multiple parties with more or less stable electoral process and peaceful transfer of power from one party to another. This gives an opportunity to examine how important macroeconomic variables are affected by the compulsion of electoral process and partisan ideologies in a developing country afflicted with persistence poverty and a large informal economy. Most of the empirical studies based on data of OECD countries have found that electoral and partisan motives have a greater short term impact on inflation than on real variables like output growth or rate of unemployment. Recent studies based panel data on OECD countries have reinforced these findings. The present study is an empirical attempt to explore the nature of this nexus in case of independent India using 62 years of monthly data on inflation supplemented with data on election and ideological stand of political parties in power. Real variables have been kept out of the purview of this paper because of lack of long term low frequency data (at least quarterly) on output. The coverage of monthly index of industrial production is limited to formal sector and workers in organized sector constitute a small minority of voters. Studies on inflation in India have pointed out that both structural factors and monetary factors are important determinants of inflation in a country like India where rain fed agriculture is still important and imported oil is a major source of demand for foreign exchange. Thus internal shocks precipitated by weather induced failure in agricultural sector and external shocks arising out of spurt in oil price need to be factored out to identify the impact of electoral motives and partisan ideology on Indian inflation dynamics. Subject to availability of relevant data, the paper has attempted to carry out such analysis for a truncated period. The present analysis also takes into account the fact that there is an important structural break in Indian electoral politics since 1977. Before that there was a one party rule in the centre, although the break in states had come in 1967. After 1977, India has seen rule by coalition of parties as well as single party rules. When a coalition is led by a national party playing the dominant role, we have taken that coalition as a single party rule. Like USA, the congress party is considered as left leaning party and Bharatyia Janata party (BJP) as a right wing party. formations. Prevalence of large scale absolute poverty and rural population comprising the majority of voters, every political formations have to woo the poor and marginal people to win elections. So, on a priori basis, we should expect little difference in behaviour of political formations with regard to fiscal and monetary policy stances in periods leading to and after elections. There is another dimension to policies that impact inflation. This is the presence of a central bank which is known to be one the most professionally run central bank of developing counties. One interesting fact about the Reserve bank of India is that many of its governors were career civil servants. These bureaucrats are members of the elite federal government service known as Indian Administrative Service (IAS). After spending the best part of their career in various government departments, they cannot be expected to differ radically from polices they were associated with in their whole career. So their view about factors that cause inflation would resonate better with politicians than the economists who may have better understanding of the monetary dimension of inflation. So in this analysis a binary variable (civil servant / economist) is used to capture the central bank’s willingness to accommodate an expansive fiscal policy. The canvas for this empirical exercise is now laid down. The target variables are two measures of inflation- a wholesale price index (WPI) and a consumer price index (CPI). WPI can be considered as a proxy for producer price index while CPI is based on the consumption basket of industrial workers- not the entire working population. Till recently, our policy makers – both in federal government and in RBI- used WPI as the official measure of inflation. For capturing the structural factors impacting WPI two components of WPI- food price and oil price indices- are considered. For election variable, eight months prior to an election is taken as the period of expansive fiscal policy and eight months after the start of the fiscal year following the election as the period of putting a break on the expansionary policy.. The later part of the election variable has been constructed to reflect the process of policy making in India. In India, the central government budget is the mechanism through which government formulates its fiscal policy. So even if a political party comes to power in the middle of a fiscal year, it generally waits till the start of the next fiscal year to roll out its fiscal policy. Any intermediate intervention is not expected to have any major change in already budgeted incomes and expenditures. The empirical exercise is based two statistical procedures. These are regression based procedures and Anova based procedures. The regression based procedures takes into account the autoregressive nature of the target variables. Original variable as well as residuals from auto regression are used as dependent variable. It needs to be pointed out that inflation variable is found stationary process in India. As regards Anova based exercises, the GLM procedure is to take into account the unbalanced nature of the implied factorial design of the exercise. For the entire period (1954 to 2016), RBI governor dummy is the only explanatory variable that comes out significant along with food inflation (oil inflation data not available for entire period).The lagged dependent variables are included in the regression but not considered as explanatory variable. Election variable is not significant for any combination of explanatory variables. This result remains same whether residual from autoregressive equation or original variable (WPI) is used. For the truncated period (January 1977 to August 2016), even food inflation shows no explanatory power. Only RBI Governor dummy comes out as significant. Indian economic reform was initiated in July 1991. Using data from the next financial year, regressions have been run for WPI inflation using many other variables for which time series data are available. These are central bank’s credit to government and growth in money supply and oil inflation. Using these variables, it should be possible to identify whether after accounting for these variables, one can detect any explanatory power for factors like Election and RBI Governor. The resulting regression shows that Election dummy does not appear to have any explanatory power for inflation. If the WPI inflation is regressed on other explanatory variables and the residual from that regression is regressed on the variables of our interest, then only Election variable appears to have no significance. Both Party and RBI Governor Dummies are found to be significant at 5% level. The Anova exercise based on appropriate Sum of Squares shows that mean inflation varies significantly with regard to RBI Governor factor and not with regard to Party factor. Result is much stronger when the truncated period from 1977 is used. However, when Party and Election are taken as influencing factor, mean election for the whole period differs significantly with regards to the Party factor and not according to the Election factor. After 1977, however, mean inflation differs significantly across both the factors, namely Election and Party. As regards CPI data is available from 1969 to 2016. For the whole period the results are similar to the ones reported above with one exception. If food inflation is not included as explanatory variable, Election variable turns out to be significant. But if both food inflation and Election variables are used, only food inflation shows a significant impact on CPI. However, RBI Governor dummy always appears as a significant factor. For the truncated period (January 1977 to August 2016), Election variable comes out significant in different combinations of explanatory variables. Two important conclusions emerge from the entire exercise. For a developing country like India, where the electoral process is well established, all political parties perforce have to follow policies that appeal to majority of voters. The burden of managing inflation more depends on the views of central bank governors to management of inflation. When civil servants are governors, the possibility of central bank accommodating fiscal profligacy of the politicians are relatively more as compared to the case when professional economists are in the helm of the central bank. With the end of one party dominance, the electoral motives appear to be slowly emerging although results are weak. As CPI starts becoming the inflation variable to be tracked by policy makers, the present exercise indicates that there is a distinct possibility that electoral motives would come into play in engendering a Political Business Cycles in India also.